We’d love your help. Let us know what’s wrong with this preview of The Art of Innovation by Tom Kelley. There isn't a business in America that doesn't want to be more creative in its thi IDEO, the widely admired, award-winning design and development firm that brought the world the Apple mouse, Polaroid's I-Zone instant camera, the Palm V, and hundreds of other cutting-edge products and services, reveals its secrets for fostering a culture and process of continuous innovation. To ask other readers questions about The Art of Innovation, please sign up. Too many words, too few ideas. I value a non-fiction work on its steep learning curve, proper data & facts and precise construction. I cannot say that the book performed very well in all criteria. The book does offer good insights into product development & pave ways into creative process. But the construction could have been more organized. Well you can forgive that for a first book & the fact that it is about “creative process”. It does lack insights driven by proper data/facts. All Too many words, too few ideas. It does lack insights driven by proper data/facts. All that insights based on “it felt good/bad” just does not seem interesting & valuable enough for a business book. The major drawback the book suffers is that: IT CAN BE EASILY CUT INTO HALF. Well there are just too many redundancies, too many places where the author is saying the same thing with different packaging. There were times I got lost on the core ideas. But overall, I cannot ignore the insights & say they were not valuable. The book does provide a very good way to guide creative thinking process. This was a good set of innovations that the Ideo had been involved in over the years. It begun really interestingly but seemed to go on anf on in the same vain. I am nit sure how much I got out of the examples. There seemed to be less insite in to the process of innovcation how to be more innovative in a modern world. It feels a bit like a corporate autobiography, with its many stories, looking back how things worked before, like leafing through an interesting photo album at a friend's house. Still, I did take away quite a few notes, that seem to influence my thinking in general, almost right away. - So many different way It feels a bit like a corporate autobiography, with its many stories, looking back how things worked before, like leafing through an interesting photo album at a friend's house. While many of the examples (e.g. Palm V) were dated, this book remained a very interesting read. Through ample supply of fun stories, I got a glimpse of the day in and out of innovators' life at Ideo. While design thinking becomes very popular these days and there are many workshops offering the experience (e.g. in 1 - 2 days) in a more defined and succinct way, it becomes even more valuable for me to learn about where the history/the journey/the enthusiasm was rooted. Just like how I think about reading a "how-to" book or attending a course is like the 1% and 1 data point of the story. The story of "casual -effect" The "effect" is the book/workshop. Without the looping and dynamics of internal and external causes 天時地利人和 and these causes building on each other, the "effects" shown up in how-to book/sharing/workshop would not the same. Therefore, I found it quite fascinating for reading the juicy stories (even though some seem repetitive). Maybe it is through these bits and pieces, they gave me insights through connecting the dots and that fits my learning style. Success depends on both what you do & how you do. There are always more opportunity to create excitement then you think. Entering fun competition & mastering fundamentals. Creating seamless wow experience: Learning from Vegas & AU. How could you turn ___ Success depends on both what you do & how you do. Creating seamless wow experience: Learning from Vegas & AU. How could you turn ___ into fun experience? Think of product in terms of verbs rather than nouns. Create for entertainment. Give experience gifts. Barrier jumping: What are the potential obstacles to adoption? Ritual rewards, FUD factor ,Cultural, generation, gender differences. How could you make your idea more approachable?Evangelism works. Tom Kelley clearly loves IDEO and his brother Dave. His innovation advice focuses on products, and is difficult to translate into processes, especially as his big takeaway is for "rapid prototyping." He does have some thoughts on group dynamics and office space. Overall his ideas are reiterated a few too many times and the advice isn't concrete, while the anecdotes are more fun for Kelley than for the reader. The historical aspect, IDEO's numerous inventions, is interesting. First published in 2001, almost all of the product and company examples are out of date (Netscape and Palm). The concepts though are even more relevant and important today than that hey we’re back then. This book will help you apply the concepts of Design Thinking to you company, product, service or software. Tom Kelley writes a great story on the many paths to innovate in the business world. It also stands as a company brochure to promote and share the best practices at IDEO (world leading design firm), Kelley’s firm. All concepts and techniques are illustrated by case studies and real-world examples, so that every reader can understand and most importantly apply that knowledge. One of the quirky things about the way that I dig into topics is that sometimes it’s like reading a book from the back to the front. I read the most recent things first before getting back to more foundational works. That’s absolutely the case with The Art of Innovation. I have previously reviewed Tom and David Kelley’s book, Creative Confidence, which made mention to this earlier work. It was also referenced in The Medici Effect and The Innovator’s DNA. Getting back to this classic book was jus One of the quirky things about the way that I dig into topics is that sometimes it’s like reading a book from the back to the front. I read the most recent things first before getting back to more foundational works. That’s absolutely the case with The Art of Innovation. I have previously reviewed Tom and David Kelley’s book, Creative Confidence, which made mention to this earlier work. It was also referenced in The Medici Effect and The Innovator’s DNA. Getting back to this classic book was just a matter of time, given the respect that other authors have for Tom Kelley and the team at IDEO. Really interesting reading about a lot of history in design thinking. Is amazing how close their predictions were reading this 17 years after it was written. A lot of good ideas about how to build a place that encourages innovation. Very focused on product design however. Something how well it translates to services. Lots of great ideas from a firm that I deeply respect. While I agree with and appreciated the point that some level of fun/playfulness is required for Innovation, I didn't appreciate that Tom applied this point to the entire structure, prose, and content of this book. It's a very folksy telling, which made it entertaining but also less rigorous, structured, and fact-based. Many tidbits of wisdom assembled in a whimsical style that seems to give a very good insight into the culture of the Ideo design firm. While the book does reflect a great creative culture it doesn't feel like it systematic or rigorous enough to build strong knowledge. I suspect version 2 of this book "Creative Confidence" will be an improvement and I am looking forward to reading it next. Audible. Ideo sounds like a pretty awesome company. Book was a good reference guide on some stuff to try with innovation/design. Material covered in the book is very similar to other innovation/business types. Wonderful read from a general manager at IDEO talking about this innovation consulting firm’s philsophies: focusing on storytelling, focusing on user experience to make it unique, how to brainstorm effectively, and how to prototype well. It could have been better book with better writing style, author may claim this as his “unique” style of his own but as a avid reader , I found it boring. Good ideas though , it just needs Midas touch of better structure. Although the book focused on innovation at IDEO it contained many strategies which can be adapted for various industries. 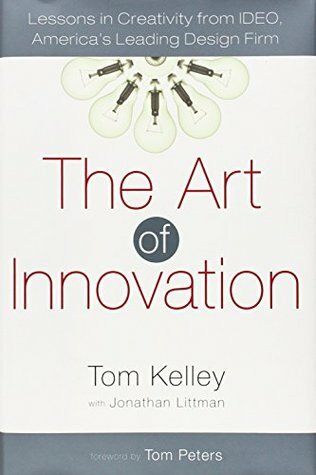 Definitely a good read for anyone looking to incorporate a culture of innovation. At times it was a great book and at other times I was bored. But saying that they're some great insights in this book that I'll be using in the future. Es como un comercial de IDEO. The history of IDEO and their projects. Es un libro muy parecido a las 10 caras de la innovación, nada más que en este caso está más orientado a las metodologías ágiles centradas en las personas. Loved it! Great stories and insights into innovation. This book portrays how IDEO works. The secrecy behind they continuously innovate and almost all sort of sectors. A little out of date now technology wise but still a valuable tool for innovation and an enjoyable read. Some interesting ideas that would have fit well in a short blog post, interspersed with lots of self congratulatory anecdotes for padding and 20/20 hindsight. Thomas Kelley runs the marketing side of the hugely successful industrial product design firm IDEO. His brother, David, started the company in 1977 in Palo Alto, CA. One of his earliest projects was designing the first mouse for Steve Jobs at Apple Computers.